So if you really need to use Java in either Windows or Linux, I’m going to show you how to get around this. After doing this you should see the Java Control Panel launching. In this control panel you can modify several security settings, this window should look the same in Linux and Windows. 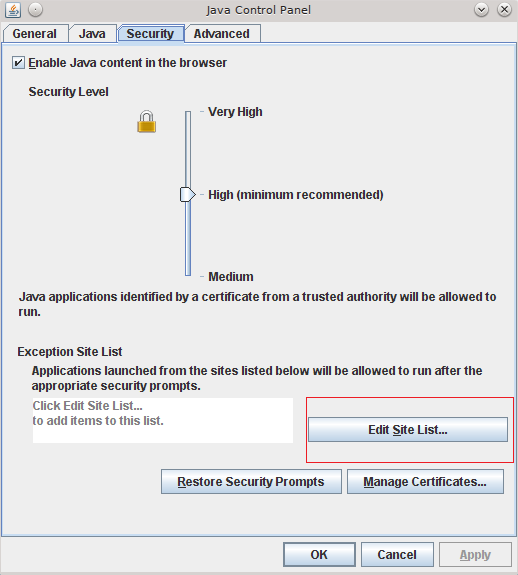 Go to the security tab and click on the Edit Site List button, in the next dialog, enter the URL to the site you want to add as an expection to the security level and click OK.
Click OK until all dialog boxes are closed, restart your Internet Browser and try to load the site that was blocked before. 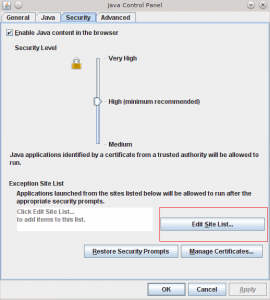 Keep in mind that it is not recommended to lower the global level, instead we want to use the Exception Site List.